Not one other diner in sight for Dinner on a Saturday night at Japanese Restaurant Cocoro ?! 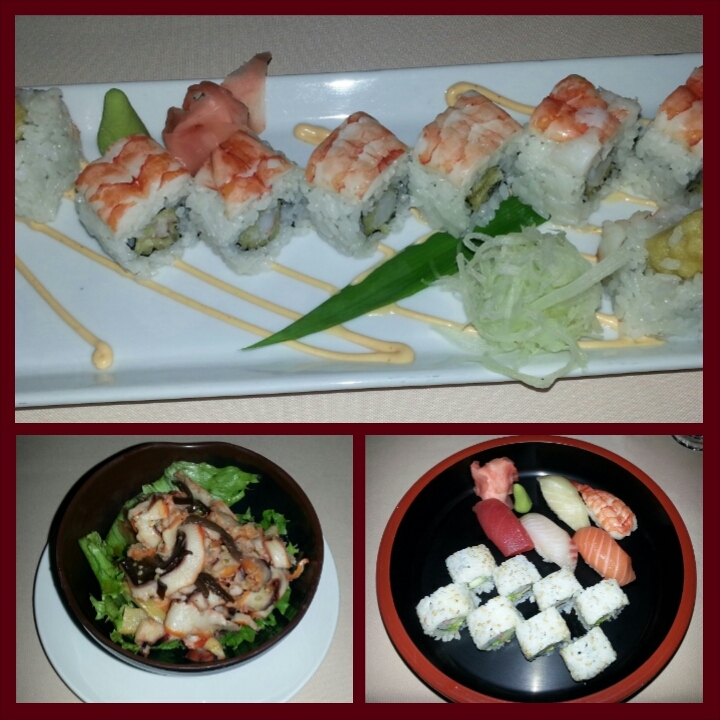 There were surprisingly NO other diners at Japanese Restaurant Cocoro on date night last Saturday. But was it really a surprise? With the currently revamped, more modern and more comfortable Roe in Sovereign North, the popular East Japanese and scenic Majestic Sushi and Grill as competitors? The advantage was a private, more intimate environment. But what about first dates where persons may not be as comfortable together with conversation yet or groups that come for dinner? I’m sure they would like a bit more buzz around. The only obvious thing that has changed at Cocoro are a few new items on the menu. Good service and food quality have never been an issue, but surely the decor needs a change. The surroundings are just outdated and not even modern antique. Some kind of marketing also needs to be done with new offerings to make persons remember Cocoro exists. Address: 4 West Kings House Close, Mayfair Hotel, Kingston. Simply Red’s 25th Anniversary was a night to remember. Relaxed atmosphere with a wide variety of wine and food as expected. The only thing lacking was a range of desserts. Chocolate Dreams locked up shop pretty early and there seemed to be mainly Mousses and Pana Cottas. Other than that, nothing to really bite or cut into. The tents were also pretty hot, probably as a result of humidity setting in after the evening rain, but no fans were in sight. The logistics however, allowed enough space for persons to walk around freely in the large central area to cool off. It would be hard to give highlights, as every chef, caterer, company or organization had something special to offer. UTECH had a few stations. You could hardly taste the lobster in their Lobster roll with red pepper remoulade, but their Brined Duck Breast with breadfruit soffrito was cooked to perfection. Brian Lumley’s signature Herb de Provence Chicken marinated with white wine was up to good standard as usual, complemented by mushroom cream sauce and red pepper coulis. The Ham stuffed 689 Croquettes were decent as well. Chef George Matthews had a wicked Steak flank with Corn on the Cob and Barbecue Oxtail! The Barbecue Oxtail was alright, I expected more with the sauce and it surely didn’t slide off the bone. Rainforest Seafoods had Smoked Marlin sandwiches that had way too much butter, but a Bread pudding with cheese and an optional honey topping that was delish. Their Avocado salad with arugula was also divine. The Chilean’s Grilled Beef Tenderloin with Pebre had a savoury, unique taste. Unfortunately the beef was not tender enough and the representative did not sufficiently or enthusiastically explain the dish. Perhaps the kids also representing the booth that were oh so adorable, stole her spotlight. 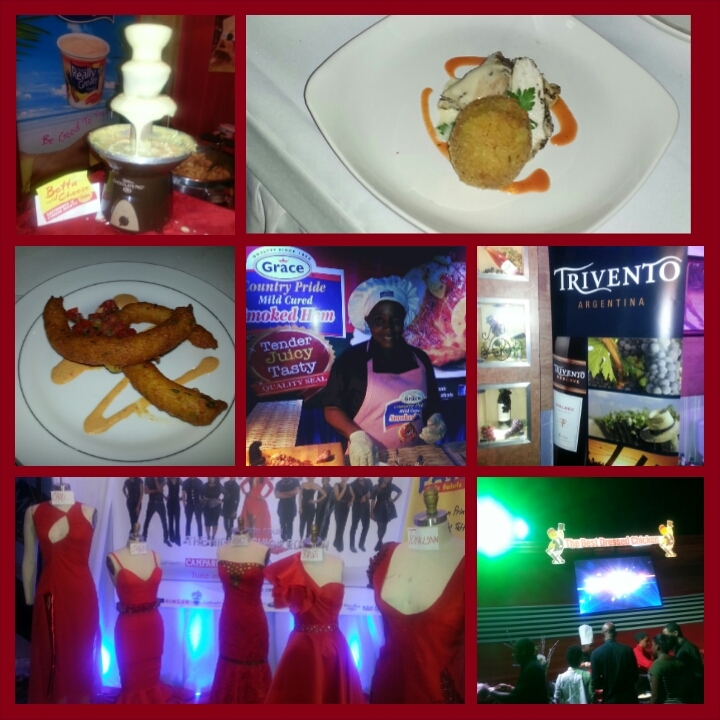 Interesting and fun options were Tastee’s cheese fountain with potato wedges and Kendel’s Mackerel Tempura rolls. Persons that wished to load on the carbs had unlimited options of pastas, noodles, lamb and beef burgers as well. Jacqui Tyson put on quite a show with her Best Dressed Fried Chicken and dancing chefs. Her area as well as the Pop Up Gourmet/CPJ booth, were crowded all night compared to all the others that had a free flow. Kudos to Jacqui for occasionally going on the mic to keep the crowd in the know of what she had to offer, raising person’s interest and having them go back for more. Mission Catwalk also had a booth showcasing red dresses made by contestants, of which there was a poll going for the best dress. Only two were impressive, though the others showed great potential and it was a good promotion for the show. Grace, Campari, BETCO Premier Ltd. along with JMMB, CPJ wines with Pop UP Gourmet, Select Brands and the Chilean representatives kept the spirits flowing all night. The Little Penguin Chardonnay and BETCO’s René Barbier Blanco were the winners for me. The event seemed to be well supported, so hopefully The Heart Foundation reached their target and it will be even more spectacular next year. Have NO FEAR Jamaican Gladiators! Scandal will be on LIVE tonight on FLOW! Gladiators, FLOW has received official correspondence that the NEW Season 4 of Scandal will not be blocked from ABC tonight. CVM only has the rights to show up to Season 3 and no other network has dared to attempt such. Get your popcorn and wine ready at 8pm tonight! Pre-game with Grey’s Anatomy at 7pm. 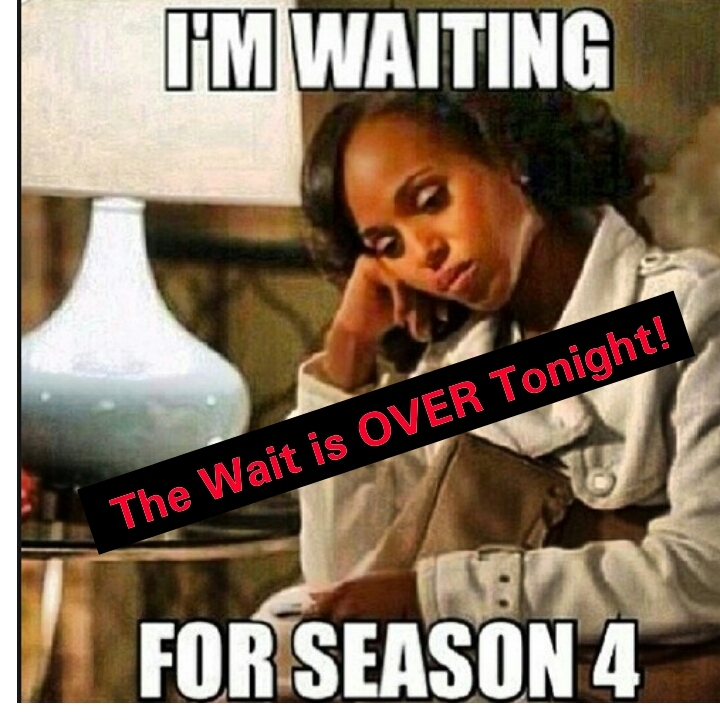 ABCFlowGladiatorsOlivia PopeScandal Season 4Where is Olivia Pope? The Heart Foundation’s annual fundraiser, Simply Red, will be tomorrow on the lawns of Jamaica House at 7pm. You should still be able to get tickets at The Heart Foundation of Jamaica, Pop Up Gourmet, Swiss Stores (Downtown) or Island Grill (New Kgn, Twin Gates & Manor Park for $5000JMD. 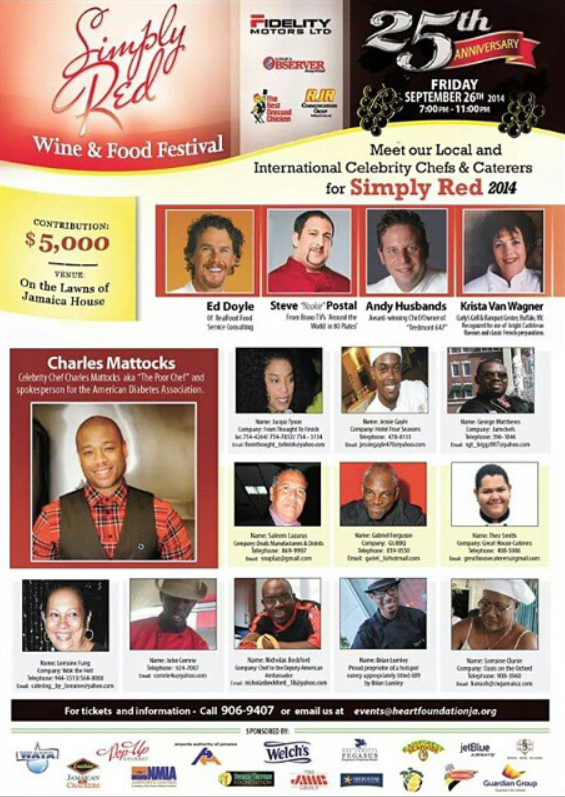 Celebrity Chefs and more will be there! 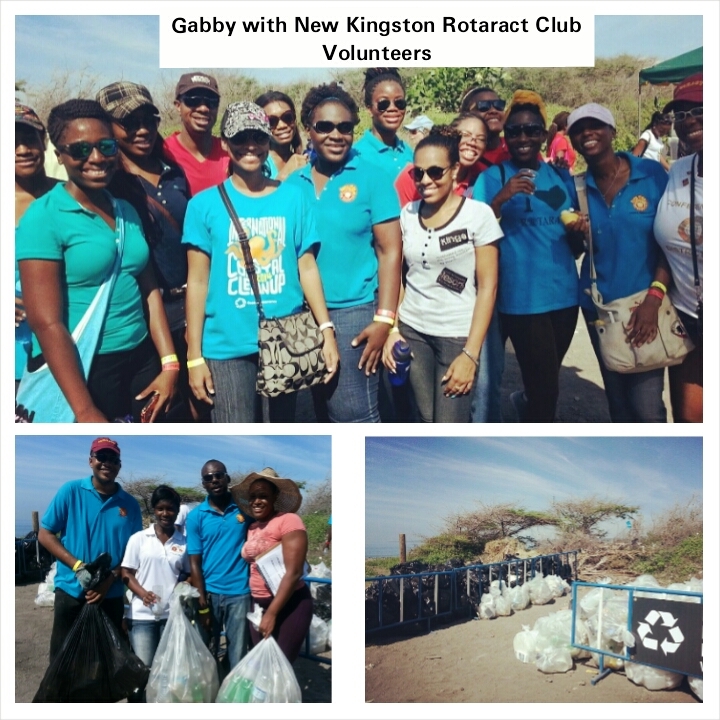 International Coastal Cleanup Day Jamaica 2014 was a Success! On Saturday, September 20th, the Jamaica Environment Trust (JET) had overseen over 100 cleanup sites island wide, including 10 underwater with the participation of 1000s of volunteers. Gabby from SuGa volunteered by the entrance at the Palisadoes strip. Registration was smooth and very organised, since the majority of volunteers were pre-registered and already had armbands. The garbage collected was significantly less this year compared to last year, which is a good indication that JET’s environmental workshops and various awareness programmes throughout the year are starting to pay off. Kudos to JET, as well as the Urban Development Corporation (UDC) and the National Environment & Planning Agency (NEPA) who partnered together and organised a massive cleanup at Hellshire Bay Beach. Keep Jamaica Clean, ‘Nuh Dutty Up Jamaica’ ! SuGa doesn’t need to wait for our Jamaican stores to put out the memo, they probably won’t even publish it, but they are obligated to participate. 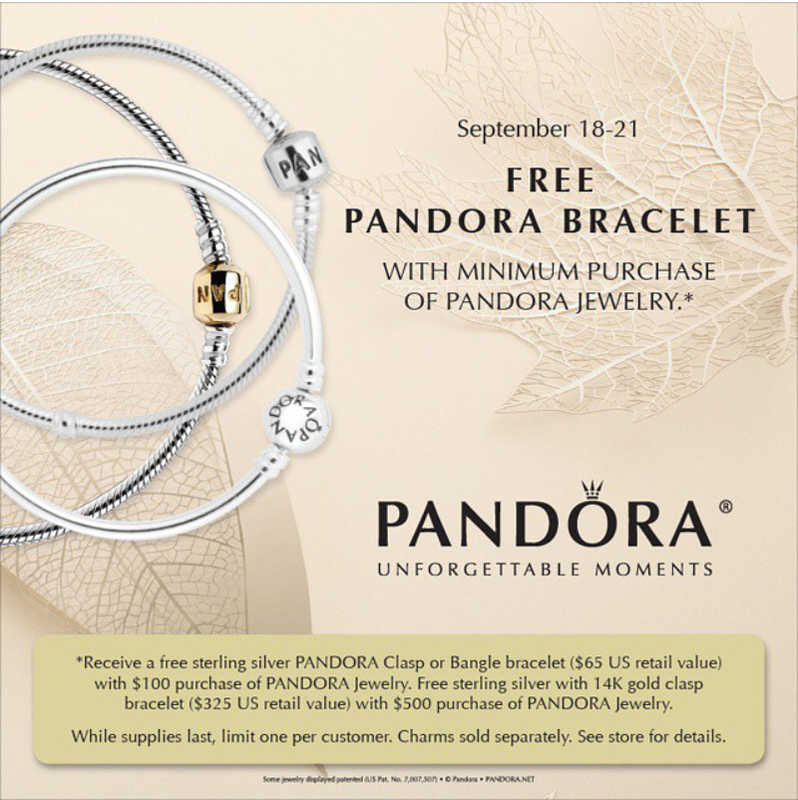 The Free Pandora Bracelet promotion starts today so you can visit any Pandora retailer near you. 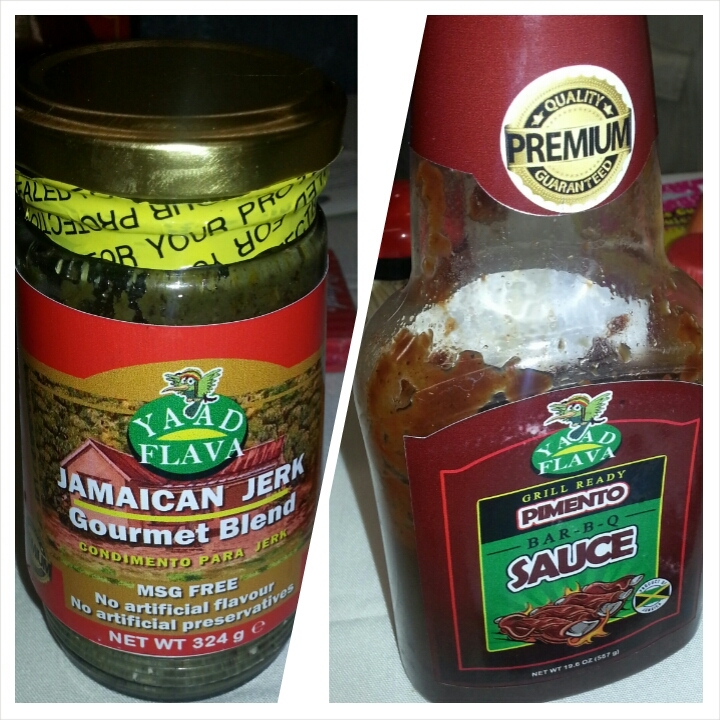 Last Saturday, Yaad Flava representatives had persons flocking their booth to enjoy their Jerk chicken seasoned with their Jamaican Jerk Gourmet Blend topped off with their Ketchup or Barbecue sauce. The Ketchup had a spicy flavour that would give meats such as chicken, franks and burgers a unique flavour, if you didn’t want it to taste like traditional ketchup. Some persons add ketchup to everything, so mix it up a little. Now the Barbecue sauce was really peppery and would work well with anything you put on the grill. I was also surprised to hear that their well seasoned Jerk Chicken was only left for 5 minutes with their MSG free Jamaican Jerk Gourmet blend seasoning before cooking.. The packaging and labels looked official and calorie counts will be added at a later date according to the representatives. The products are reasonable, some about $600JMD and are all available at Sovereign Supermarket in Sovereign Centre on 106 Old Hope Road, Kingston 6.